An expert review on the best raw and barf diets for dogs 2019. 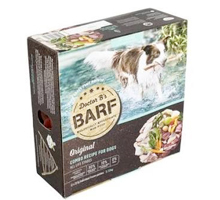 So, what really is the best raw or barf dog food for your pet in 2019? Ok, so you’ve done the research and you know the healthy benefits of feeding your dog a raw diet, but now you need to know which really is the best raw dog food to buy. Well you are in the right place to find out. 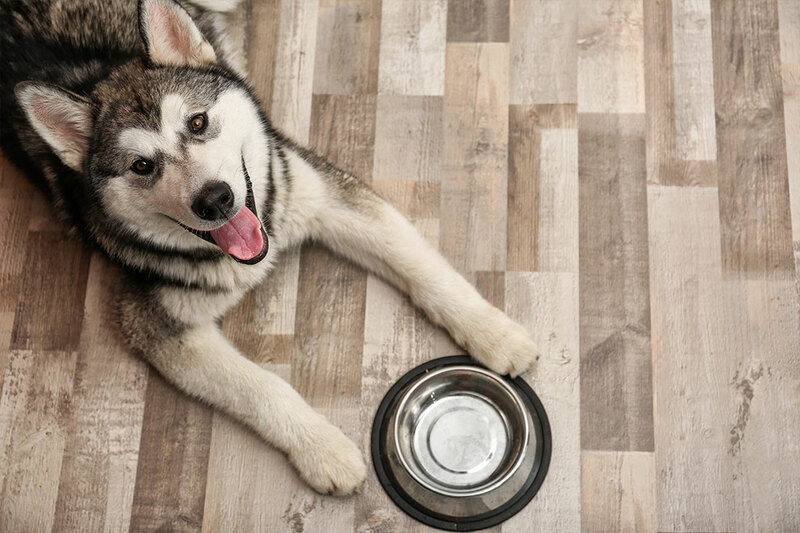 With so many types of dog food available in Australia, it can be confusing, here we reveal the stand out recipes and brands to consider. Some raw foods truly reflect the ideals of the raw feeding and prey diet philosophy, where as others are only slightly better than highly processed feed options already so common in the pet food industry. Our experts found that each formula has distinct advantages and disadvantages so hopefully this review can help you make an informed and reasonable opinion on what is the best raw and barf food for your dog. So, let’s fetch the results (sorry, we love animal puns). We rank and expert review the top 7 best raw dog foods in Australia for 2019. Keep reading to find out the best, latest and most popular raw frozen pet foods to buy. 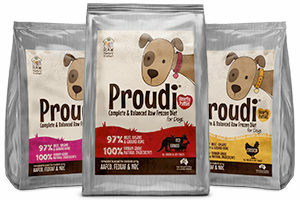 We review Proudi Raw Frozen Diet for the best raw and barf pet food diets for your dog review. ✔ Pros: An absolute stand-out product. Not only is it 100% human grade, it is 100% balanced and complete to three international pet nutrition standards, meaning everything your dog needs is right inside. The heart shaped / snap frozen patties are so cute and individually wrapped making them super convenient to thaw and serve. ✖ Cons: Expect to pay a few dollars more than other raw pet food brands, however it is human grade and packed full of nutrition. It doesn’t contain any vegetables (which really aren’t that great for dogs anyway), it also isn’t available in supermarkets. ▶ Verdict: An outstanding All-In-One raw dog food. Human grade only, balanced and complete, and super easy to feed. 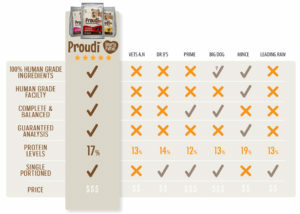 Whether you are a raw feeding expert or just starting out, Proudi is quite possibly the best raw dog food currently available. 👍 Expert Tip: With so many advantages, this is a very popular product, but the stockist locator on the proudi.com website isn’t great, so we recommend calling your local pet store before you visit as some recipes sell out quickly. ✔ Pros: A classic raw food, combining key meat and organ ingredients. Contains 76 micro/macronutrients all with varying usefulness. A low fat, low carb and high protein ratio which is similar to most others. ✖ Cons: It isn’t a complete nutrition formulation, meaning you will still need to add other food nutrients to meet guidelines. The pouch format also isn’t very user friendly, particularly if you want to manage portions and freeze, or keep a clean kitchen bench. 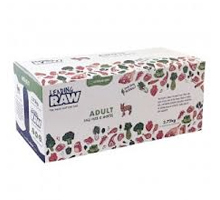 ▶ Verdict: The makers of this product also have a range of heat treated / pasteurised and dehydrated products … which to many raw feeding experts raises questions as to if they really do believe in the benefits of raw feeding. 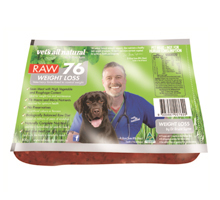 ✔ Pros: An OK entry level product in the raw feeding and BARF pet food section. 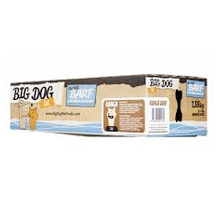 The brand is owned by a global pet food giant and is easily available and cheap. ✖ Cons: A quick read of the ingredients and you will see why its so cheap. Check the recipe carefully, particularly if your dog has allergies as what may look like a single protein eg: the Beef recipe, has chicken as the first listed ingredient. ▶ Verdict: Lovely packaging and marketing, but the actual product falls short of the mark. It isn’t a balanced and complete pet food, in addition doesn’t mention the use of human grade ingredients anywhere. Unless it’s a feeding emergency, give this one a miss. We review Prime 100s BARF for the best raw and barf pet food diets for your dog review. ✔ Pros: This product ticks quite a few boxes, balanced and complete and with some good recipes including crocodile, lamb and kangaroo. We will let you make up on your own mind on whether the inclusion of vegetables is good or bad, but either way we would have preferred more protein from meat and organs. ✖ Cons: Delivering only about 10-12% protein, this is a little low for the category, it also isn’t the most convenient to thaw and serve. ▶ Verdict: Overall, an OK Raw and BARF style dog food. Unfortunately it isn’t a human grade product, nor made in a human grade facility. The brand also doesn’t make mention of compliance with any international nutrition standards. ✔ Pros: One of the first Raw Feeding brands in Australia. A good range of recipes as well as some good treat products. Recent marketing efforts mention some human grade ingredients but the products we tested didn’t have human grade on the ingredient list or packaging. ✖ Cons: The frozen brick format isn’t the most convenient to thaw or serve, and we have noticed variability in the look of the products between batches. The protein levels are also a bit lower than some other products available. The smell and thawed blood in the product may be very off putting for humans, and some dogs simple wont eat it. ▶ Verdict: Another OK raw feeding pet food product. The recipes are a bit outdated based on some of the other brands now available. A generally good product, but if you can afford to spend a few dollars more per pack it could be worth trading up. ✔ Pros: Available everywhere and a good first step towards including some raw meat into your dogs diet. It is also human grade so you can have confidence in the quality and safety of the product. It is also affordable and easy to find different protein sources. ✖ Cons: Mince falls well short of delivering all the nutrients your dog needs, so you will need to feed other products to ensure they are getting a full nutrition profile. Depending on the grade of mince, it may also have quite a high fat content, so keep an eye on this. ▶ Verdict: A great place to start with raw feeding, but you should really be adding some raw meaty bones and animal organs like liver, heart and lung to get the benefits from raw feeding. ✔ Pros: A cheap raw feeding option, particularly if you shop in Costco. Its affordable and if you are on a budget, or have a family of large dogs this may be suitable. ✖ Cons: Doesn’t claim to be a balanced and complete source of pet nutrition. The range is also very limited. Fussy eaters may also find it unappealing. ▶ Verdict: A very basic product, with a bit too much tricky marketing around ingredients and ingredients sources. 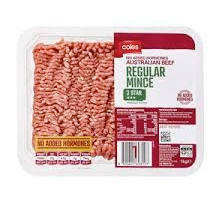 Based on simple mathematics, the price would indicate the product is little more than a multi source mince blend. 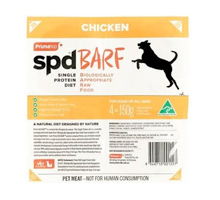 Well there you have it, an overview of some the best raw feeding and barf pet food products available in Australia in 2019. When choosing a raw food for your dog, you need to consider the nutritional aspects, but also the quality and safety of the ingredients used. *Note: These reviews are based on information provided on pack and from manufacturer/retailer websites. No responsibility is taken for errors, omissions, inaccuracies or changes.